Our in-house design team specializes in create one-of-a-kind playscapes, but it’s not everyday we are asked to design and build a Trojan Horse! Barnwell School—“Home of the Trojans”—came to us looking for a customized playground design that tied in with their school identity and promoted school pride. Equally important, they needed a design that provided inclusive play experiences for a young student with mobility challenges while delivering fun for the entire student body. Our team exceeded their wildest dreams with our massive, ship-shaped play structure. The focal point is the Trojan Horse which not only captures the school mascot, but doubles as an exciting climber. Side-by-side wheelchair ramps and accessible stairs allow easy access for all abilities. Accessible rings and an extensive overhead circuit provide upper body action while number of swings, including our accessible U-Swing, provide the motion kids love. Since the new playground has been in place, the little girl who inspired the design has been able to join her classmates on the playground. Parents and teachers report that her confidence has grown tremendously as a result. 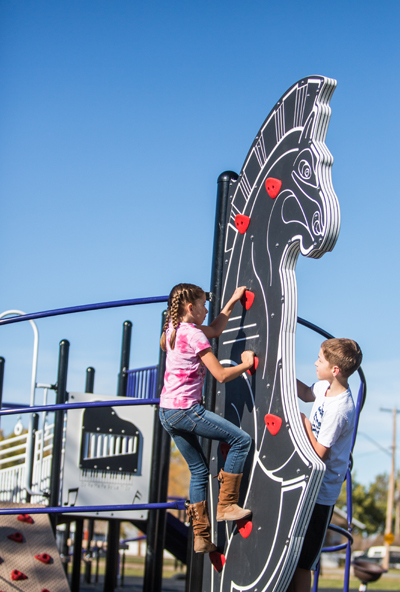 Not only is Barnwell’s Trojan Horse the centerpiece of the school’s recreational space but it has also become a popular play destination for the entire town. This stunning ship-shaped structure features dual wheelchair ramps and a myriad of inclusive play. Ramps and accessible stairs ensure easy access for children and caregivers with mobility challenges. Details promoting school pride as the "Home of the Trojans" was incorporated throughout. Accessible rings provide upper body fun for younger ages. More challenging upper body activities were incorporated to engage the entire student body. Our U-Swing provided inclusive motion-based play. Are you looking for something similar? Want to know more about this design and how we can help you build your dream playground?